What a fabulous way to start the new year...a fun new Sewing 101 Guest. Please enjoy Gwen's tutorial on making a mitered corner. Hey! I'm Gwen from Gwenny Penny. I was so excited when Chris asked me to write a post for her Sewing 101 series. I love to sew! Today I'm going to teach you how to miter a corner two ways. Let's get started! Method 1: The first method is used when you don't care about finishing the hemmed edge. For example, maybe you are making a little patch to sew on a shirt or a bag. The raw edges won't be seen, so they don't need to be finished. Step 1: Take your piece of fabric and fold one side over using whatever hem width you plan to use. Keep the hem width even down the entire side. Press. Repeat for the other three sides. Step 2: Unfold your hems that you just pressed. Take one corner and fold it over so that the press lines in the triangle line up with the press lines along the sides (see the center picture below). Press. Repeat for the other three corners. Step 3: With your corners pressed in, fold each side in again as you did in step 1 and press again, lining up your mitered corners as you go. Repeat until all four corners are complete. You now have four nicely mitered corners! I use this method to create little fabric patches to sew onto my daughters' shirts. Method 2: The second method is used when you need a nicely finished hemmed edge. 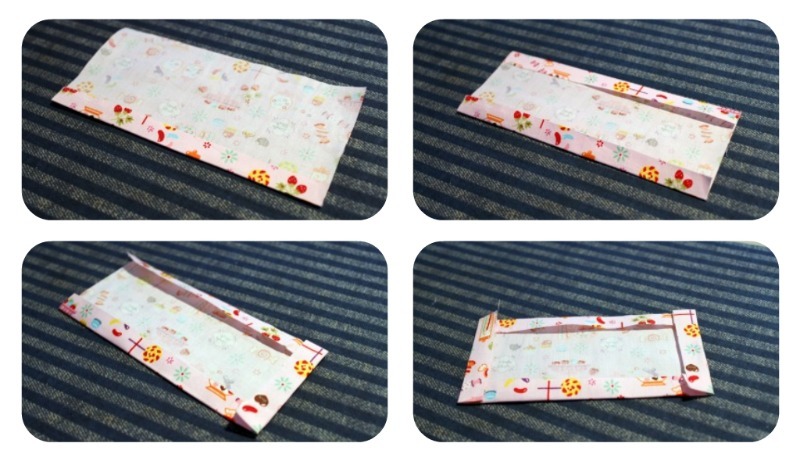 For example, if you are making cloth napkins, you would want to use this method. I also use this method to make patch pockets. Step 1: Take your piece of fabric and fold one side over using whatever hem width you plan to use. Keep the hem width even down the entire side. Press. Fold the same side over a second time and press again. Step 2: Repeat step 1 for the other three sides. Step 3: Unfold your hems that you just pressed. I've drawn a line to mark each press line so you can see what I'm doing more clearly. Step 4: Take one corner and fold it over a little bit so that the press lines in the triangle line up with the outermost press lines along the edges (see photo below). Press. Step 5: Unfold the small triangle. Take the same corner and fold it over again so that the ends of the outermost diagonal press line (the one you made in step 4) touch the innermost press lines on the sides (see photo below). Press. Step 6: Repeat steps 4 and 5 for the other three corners. Step 7: Unfold one corner. Again I've drawn a line to mark each of the new diagonal press lines so you can see what I'm doing more clearly. Trim off the little triangle in the corner along the outermost diagonal press line. This reduces some of the bulk. Repeat for the other three corners. Step 8: Fold your corners in again along the remaining diagonal press lines. Press again. 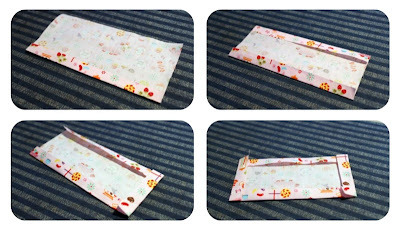 Fold in each side again along both press lines, just as you did in step 1, lining up your mitered corners as you go. Press each side as you go. Repeat until all four corners are complete. You now have four nicely mitered corners with a finished hemmed edge! I use this method to finish my table runners. If you have any questions, please feel free to email me. And, of course, you are welcome to stop by my blog anytime! Chris, thank you so much for this wonderful series and for asking me to be a part of it! Thank you, Gwen. Please hop over and visit Gwen's blog. She has so many wonderful ideas to share like making your own sewing labels, and her darling Niblet and Biscuit toys. Fantastic tutorial Gwen. Now I know what I have been doing wrong, I did not realize I could or should trim off that little piece (re the second approach). Great series Chris! Thanks so much for having me, Chris! Very clear...definitely needed this, thanks! Thank you Gwen and Chris. This is a great tutorial for an otherwise tricky job. Your corners look perfect! Wow. So THAT'S how you do that! Great tutorial- I will be checking back on this one as I make more things in the future. Thanks so much! I just went though about a year's posts and loved them all! Good topic! I love a perfectly mitered corner. Nothing beats it! I have nothing to miter today...but this is one of those posts that comes in handy. How DID you know that learning to do proper mitered corners is one of my goals for 2011? Thanks. Thank you Thank you Thank you. I needed this one! Thanks! Can't wait to try this! Great tutorial! I really should get the iron out when I mitre corners - it makes such a difference - but laziness slips in. I think it's time for me to up my game and this tutorial really helps. I'm new to alot of this sewing, but will this work with quilt corners Gwen? Btw, the corners look beautiful! I am new to sewing. I have completed a baby quilt for a benefit. Turned out fabulous! I was wondering if this technique will work on quilt corners? The corners look fabulous! What a woman! Thanks for this concise and clear lil' tut! I am a sloppy girl by nature, but I think this new baby blanket I've just finished is the most proper, even thing I've ever made!